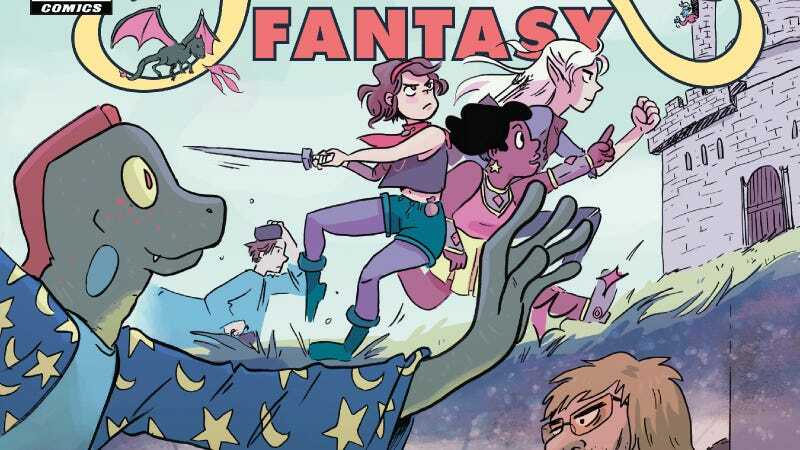 Fantasy stories typically break from reality to create spectacular worlds, but the new Dark Horse Comics miniseries, Modern Fantasy, seeks to fold relatable real-world struggles into a story inspired by Dungeons & Dragons and other fantasy adventures. Written by Rafer Roberts with art by Kristen Gudsnuk, the title features a group of roommates who fit into various swords-and-sorcery archetypes, but they’re all dealing with everyday problems like unfulfilling day jobs and student loan debt. “My number one aim is for clarity, and doing justice to Rafer’s scripts,” says Gudsnuk. “And when I’m sitting in front of a comic page for hours, drawing, sometimes little funny ideas pop into my head that piggybacks on some of his ideas, and I’ll incorporate them into the comic. I’m a comedy fan, so usually, I just run it past my own ‘is this funny?’ internal taste-tester, and if she says yes, I’m good.” Modern Fantasy is very funny, and Roberts and Gudsnuk make these characters endearing by incorporating humor into the relationship drama. It makes you want to spend more time with this cast and learn more about this world, and readers can get in on the action when Modern Fantasy #1 goes on sale June 27.